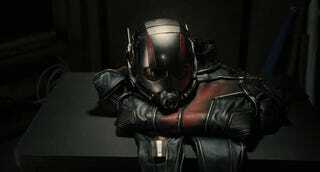 “Ant-Man” doesn’t invoke much fear, does it? The best part of the promo clip for Marvel’s next big superhero flick is Paul Rudd’s reaction. Sure, he’s getting handed an opportunity to put on a suit that gives him superpowers and redeem his pretty screwed-up life. But he’s got doubts about that moniker. Wouldn’t you?